This year I feel Christmas more than usual and I couldn’t wait to write a post about it! Today we’ll talk about decorations, perfect for a Christmas wedding (oh, how I’d love to see a wedding like this!) and of course perfect for home. There are a few I’d like to try, even if I’m late, as usual! Candles are a must have for every wedding! I love these Christmas versions with berries and pine cones. And what about Epson salt as snow? Genius! Another idea for a lovely snow effect. You can use it in garlands or attached to branches. The perfect winter décor! You can made them out of paper or, even better, you can make cookies as place cards. Green and inexpensive decorations? 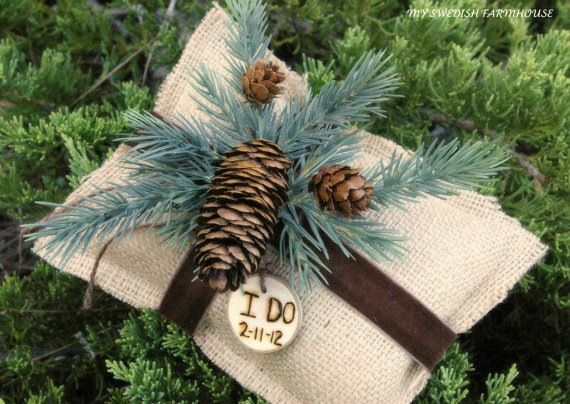 Pine cones are perfect and with green paint they look just like mini Christmas trees. I like the use of tree branches instead of the traditional tree. They look surprisingly good inside mason jars! And what about the Christmas tree? I love this mini versions!